I want to praise and thank God for all the miracles I have seen Him do in my ordinary life and I pray that all of you will experience His blessing, love and power in your lives too. I will always be grateful to my parents, late Mr.& Mrs. P.Koshy Oommen, for the greatest gift they have left me – a deep and wonderful faith in God and Jesus Christ. They also raised me to try and never give up, to be honest and sincere and to love and be compassionate to one and all. I also want to thank my husband, Dr. John V. George, children and family for all their support, encouragement and prayers and last but not least all my friends, well wishers and clients who have encouraged me over the last 5 years as a diet counsellor. I thank Hemavathi my assistant who has worked tirelessly and patiently, Mr. Malcolm who helped to plan and layout this website, Mr. Madhava Murthy, Madhava, Raghavendra and their team at SN Informatics who have worked round the clock to build and execute this website. 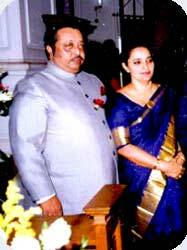 Dr. P.S Shetty who I worked under in St. John’s Medical College, who has always been a source of inspiration to me.